Browse our stock. Items that are out of stock can generally be recreated. Prices for a four yard length range from $15 up to $90 depending on width and fiber. Other lengths vary in a predictable manner. Linen inkle bands. 10/20/30/40/50/60 heddles wide. These bands hint at the range of patterns available. Here are some more bands, including cotton and silk for further comparison. Silk (10 and 20 heddles), cotton (10 heddles), linen (10 and 20 heddles). Note that most of the cotton bands will be woven in 10/2 cotton; the band shown above is 5/2. That means that a typical 10 heddle cotton band will be closer in size to the 10 heddle linen. Thread size can be discussed. 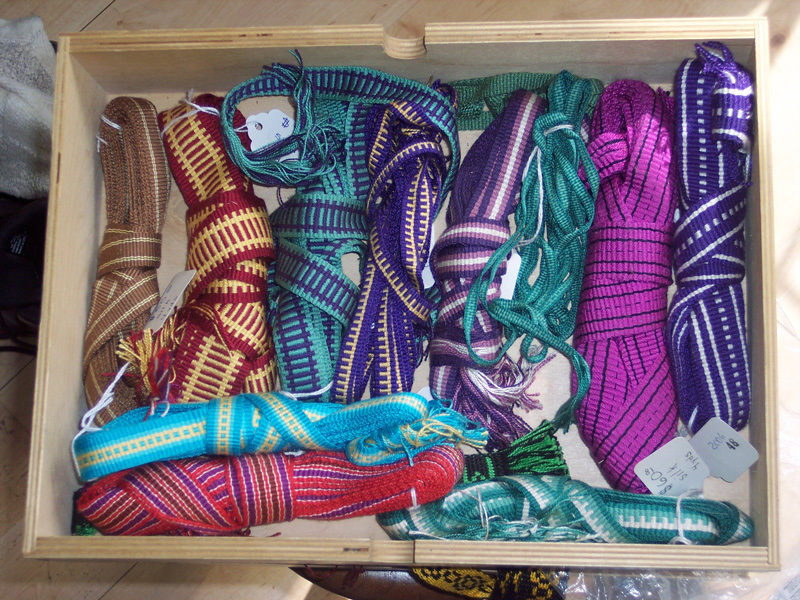 Silk (10, 20, 30, 40, 50, and 60 heddles). Silk trim in stock as of 28 February 2010.